A Cape Cod vacation is a beach vacation. 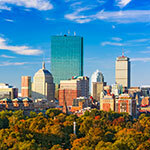 Cape Cod extends 70 miles into the Atlantic Ocean, surrounded by Cape Cod Bay on the north, Buzzards Bay on the west, Vineyard and Nantucket sounds on the south, and the Atlantic Ocean on the east. Beaches on Cape Cod Bay tend to be smooth and broad, with gentle surf, and, at low tide, hundreds of yards of tidal flats to wander and explore. These mellow Bay beaches are a favorite for kids and families. Beaches on the Atlantic Ocean side of the Cape -- including several in Cape Cod National Seashore -- may have much rougher water, including good surfing in some places. Some ocean-facing beaches lie between the water and vertical bluffs that jut high above the beach. Marvelous ocean vistas are visible from the bluffs, many of them crowned with waving dune grass and historic lighthouses. The Marconi Station Site offers a superb viewing area across this portion of the Cape from ocean to bay. Here, the outer beach is famous for its steep sand cliff located behind it. The uplands above the beach slope gradually westward, and provide a graceful vista of both the bay and sea horizons. Restrooms and bathhouse open seasonally. Watch for bicyclists along Route 6, and where the bicycle trail crosses the Marconi area entrance road. Italian inventor Guglielmo Marconi completed the first transatlantic wireless communication between the U.S. and England from this location in 1903. Map. Fees: Daily vehicle, $20; motorcycles, $10; pedestrians and bicyclists, $3; annual pass, $60. Beach fees information. 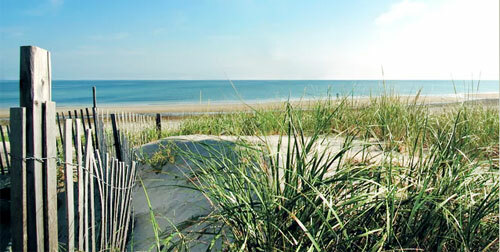 This town-operated beach on Cape Cod Bay has a wonderful long boardwalk over marshes, a creek, and dunes to the beach. Great vistas of the bay and marine life. No lifeguards; no restrooms. Parking sticker required. Mid-June to Labor Day. Ocean beach with high dunes, big waves, big wind, chilly water. Must walk down steep dune to reach the beach. Popular beach bar nearby. The ocean beach is loved for its high dunes, beach grass, and silky sand. Windy, cool water, big waves. Life guards, restrooms, snack bar. There is a popular beachside restaurant, The Beachcomber, adjacent to this beach. You have to walk down a very steep dune to get to the beach below. May be difficult for oldest and youngest visitors. Fees: Resident parking: $25 beach sticker; seasonal parking: $250 beach sticker; daily parking, $20 or $50 for three days; weekly parking, $85 (one week), $160 (two weeks). Buy stickers at 255 Commercial Street, Wellfleet. This beach also has a small parking lot behind the Beachcomber restaurant which is owned and operated by the restaurant but open for use by beach goers. Daily fee is $20; the small lot fills up early. 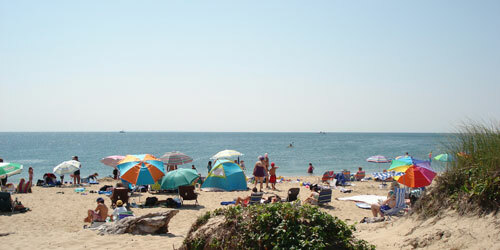 Located on Vineyard Sound, this is the longest beach in Falmouth, and is divided into an east side and a west side by a tidal stream that connects Bourne’s Pond to Vineyard Sound. Life guards; bathhouse, mobile snack bar; porta-johns; handicap ramp; beach wheelchairs. Beach parking stickers are required only for parking your car in a town beach parking lot during the summer. You do not need a sticker if you walk or cycle to the beach. You do not need a sticker from mid-September through mid-June. Only Falmouth residents and visitors staying in Falmouth may buy a beach parking sticker. Fees: Daily parking, $10; Resident sticker, $30; non-resident sticker for season, $200; for one week, $60; for 2 weeks, $70. This beach, on Nantucket Sound, has a saltwater beach, picnic area, concrete walk on a seawall, seasonal Porta-John. Open 8 a.m.-10 p.m. No life guards on duty. Part of the Province Lands of the Cape Cod National Seashore. One mile from Provincetown. This portion of the Cape is building as a result of movement of sand from the glacial scarps to the south. The shoreline here drops off dramatically, allowing whales (and vessels) to come close inshore. Beautiful sand, gentle surf, fantastic sunsets. Life guards on duty; restrooms in season (not in winter); food; wheelchair accessible. Bonfires are allowed with a permit from the national seashore. Traditionally the right end of the beach is considered more family oriented, while the left end is more gay-friendly. Map. This beach, operated by the town of Wellfleet, is on the ocean side of Cape Cod, meaning that the water will be colder and rougher than on the Cape Cod Bay side. 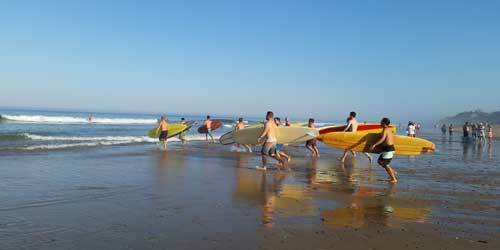 Ocean beaches offer opportunities for body and board surfing, boogie boards, and swimming. Surfing is permitted at town beaches outside of swimming areas. Hang gliders are restricted to White Crest Beach, and are allowed only before 9 a.m. and after 5 p.m. This ocean beach is secluded, very beautiful, with good surf, interesting sandbars, and wonderful views. Good beach for families with smaller children. Life guards in summer, restrooms; no snack bar. Beach managed by the town of Truro and the Cape Cod National Seashore. This beach has cool waters and tricky currents and a historic lighthouse. Huge stretch of sand with beautiful views and seal activity. It is best to walk to the beach from town (a short distance), or to ride bicycles or take a shuttle bus from town. No bathrooms, lifeguards or food service. Flagpoles at the top of the stairs warn the public of dangerous conditions. The red flag means swimming is prohibited. To park along the Bridge Street road shoulder, nonresidents and non-taxpayers of Chatham must purchase a Chatham Beach pass and display on their vehicle. Parking passes are required July 1 through Labor Day from 9 a.m.-5 p.m. This requirement does NOT include parking at the Lighthouse overlook which is still available to all vehicles for short term parking only. Ocean beach in the town of Truro. Off road vehicles (ORVs) are permitted on this beach. ORV permits can be obtained in Provincetown from the National Park Service at the Province Lands Visitor's Center on Race Point Road, after passing inspection. Cost for a one-week permit is $40; annual permit is $65; annual self-contained vehicle permit is $110. Fees: Resident beach stickers, $40 per year; non-residents: $20 weekdays and $25 weekends and holidays; $75 for a weekly; $300 for the season. Stickers required Memorial Day through labor Day. Buy stickers at Dennis Town Hall, 485 Main Street. 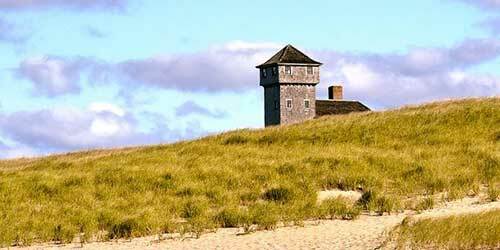 Nauset Light Beach consists of a broad, sandy beach that is contained by a steep glacial scarp behind it. During winter months, the beach profile is considerably lowered, sometimes exposing features such as the brick foundation of one of the earlier Three Sisters lighthouses. Location: One mile north of Coast Guard Beach on Ocean View Drive in Eastham. Restrooms open seasonally, lifeguard, paid parking, wheelchair accessible. Map. 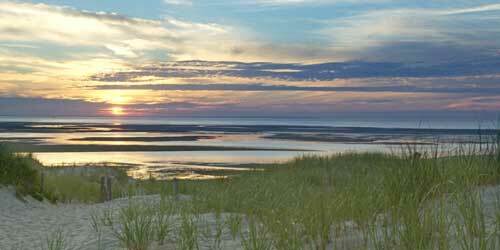 This beach on Cape Cod Bay is loved for its easy walking on the wide tidal flats at low tide. Four-wheel vehicles allowed; there is access to fishing at Bass Hole. No life guard; restrooms; four-wheel drive trail. Dennis beach map. Coast Guard Beach is a prime swimming beach in summer. Other features include the Great Beach, a sandy strand to observe coastal beach processes; Nauset Marsh, behind the old Coast Guard Station, where shore birds are easy to watch; and Nauset Spit, a barrier beach system and place to see shorebirds and seals. There are seasonal restrooms and a wheelchair-accessible ramp way to the beach. Map. From mid-June to Labor Day, the parking area at this beach open only to park staff and disabled visitors. Access is provided by shuttle bus from the Little Creek parking area (across from the Doane Area). In other times of the year, parking is limited. This beach on Buzzard’s Bay has water is warm and pleasant for swimming. A creek divides the beach; one side is the public beach and the other side is for town residents. Life guards; restrooms; bathhouse; food; handicap ramp to the beach; beach wheelchair. Fees: Daily parking, $20; resident sticker, $30; non-resident sticker for season, $200; for one week, $60; for 2 weeks, $70; local motel or hotel stickers, $10 a day. 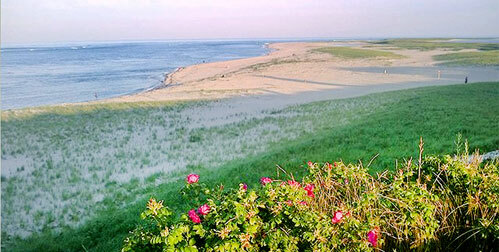 Race Point Beach, one of the Cape Cod National Seashore beaches in Provincetown, is at the very tip of Cape Cod. Vistas around the point and of the Coast Guard station are magnificent. The ocean waves here can be big and rough, with a strong undertow. Weaker swimmers should stay in the shallow areas. Surfing allowed past protected area. Northern locations makes it great for sunbathing -- with nearly full sun all day. There are dunes behind the beach and easy access to bike trails. 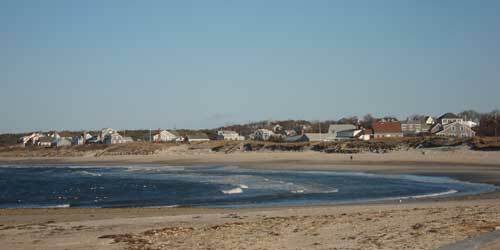 Province Lands Bike Trail leads to nearby Herring Cove Beach. Handicap parking. Map. This beach is on Vineyard Sound and it is accessible from Shining Sea bike path. Life guards; restrooms; bathhouse; food; handicap ramp to the beach; beach wheelchairs. Beach parking stickers are required only to park in a town beach parking lot during the summer. You do not need a sticker if you walk, cycle, take a taxi, etc. You do not need a sticker from mid-September through mid-June. Only Falmouth residents and visitors staying in Falmouth may buy a beach parking sticker. Fees: Daily parking, $15; resident sticker, $35; non-resident summer sticker, $250; for one week, $70; for 2 weeks, $120; local motel or hotel stickers, $10 a day. Parking fees and stickers. 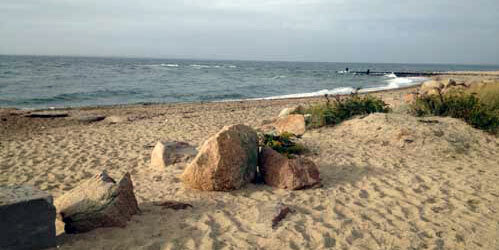 Beach is located on Lewis Bay in Nantucket Sound at the end of Standish Way. Small beach with a marina, wooden bridge, small parking lot and seasonal Porta-John. Open 8 a.m.-10 p.m. 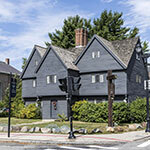 It is operated by the town of Yarmouth. Fees: Non-resident beach sticker fees are $15 for the day, $70 for the week, and $175 for the season. Seasonal beach stickers are available at the Yarmouth Town Hall, 1146 Route 28, South Yarmouth, and at the Chamber of Commerce, 424 Route 28 West Yarmouth. Ocean beach with heavy surf and occasional dangerous undertow. No lifeguards; no snack bar. Parking before 4 p.m. is only for town residents and guests staying in Truro (parking sticker required). All others must bicycle in. Open to everyone after 4 p.m. In-town guests may purchase stickers at the town Beach Office, 36 Shore Road, North Truro, daily, 8 a.m.-4 p.m. (508-349-7004). Fees: Resident or taxpayer, $15; seasonal, $175; weekly, $40; daily, (only at Head of Meadow or Corn Hill), $10; ORV resident, $10; ORV non-resident, $30. This beach, on Nantucket Sound, is the town of Yarmouth’s largest beach. Large parking area, dunes, snack bar; beach wheelchair; deck onto the beach. Showers and food concession. Lifeguards on duty 8 a.m.-4 p.m.
On Nantucket Sound Beach, this is the largest beach in Harwich with lifeguards and bathrooms. Food is from an ice cream truck that visits often. Good beach for kayakers, sailors, and fishermen who want easy access to Monomoy Island and its refuge. Directions: Several roads from Route 28 reach Red River Beach. Uncle Venie's Lane is the best choice. Do not take Red River Road (it is a dead end and does not reach the beach). Fees: Parking pass is required between 9 a.m. and 5 p.m. Non-resident parking is $15 a day; $20 a day weekends; one week, $65; two weeks; $125. You may buy a pass at the beach. Resident parking is $25 a day or $140 for the season. Buy stickers at Harwich Community Center, 100 Oak Street. Located on Lewis Bay, the beach area has swings and picnic tables in a shaded pine grove. Great form family picnics. Life guards, restrooms, bathhouse, snack bar, volleyball, wheelchair accessible. Parking sticker is required. Fees: From Memorial Day to Labor Day a daily fee or a parking sticker is required. A daily fee is $15 for weekdays and $20 for weekends and holidays. Pay at the gate. Parking stickers for $50 a week are for sale at the Community Youth Center, 141 Basset Lane, Hyannis 508-790-6345 for more info. This beach on Cape Cod Bay, operated by the town of Yarmouth, offers a picnic area with grills and a playground, pavilion, lifeguards, restrooms. Water is very calm; good for young children. Beach adjoins the Callery-Darling Conservation Area, which offers trails through wetlands, woods, and a boardwalk over a salt marsh. Learn about Waquoit Bay National Estuarine Research Reserve. 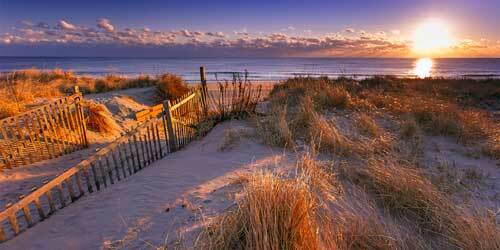 Popular beach on Cape Cod Bay offering the bay’s calm, warmer waters. Expansive tidal flats at low tide expose pools of sea creatures. Westward direction of the beach offers wonderful sunset views. Life guards, restrooms, food, wheelchair accessible. Fees: Parking is free for town residents with a permit. For non-residents, daily parking fee in $15 and can be purchased at the beach from mid-June to Labor Day. 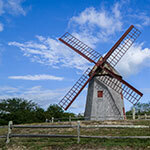 Non-resident stickers for visitors staying in Orleans are $60 a week, $110 for two weeks, and $125 for the season. Stickers may be purchased at the Nauset Beach Administration Building. This beach is on a secluded inlet of Buzzard’s Bay, and it looks out on the Bourne entrance to the Cape Cod Canal. Large beach with lots of room; volleyball space; bathrooms; concessions; life guards. Salt water is calm. Lots of passing boat traffic to watch. Plenty of parking. Fees: Must have a sticker to park and stickers are sold only to people who can show proof of a 30-day temporary residency in Bourne. (All others may bicycle or walk to the beach.) Stickers are $40 a week and $60 for two weeks. You can buy a sticker at the Natural Resources Office, Town Hall, 24 Perry Ave., Buzzards Bay. Mid-June through Labor Day. Ocean beach with big waves, chilly waters; large sand dunes. Food concession. This broad ocean beach has massive sand dunes, big ocean waves, and chilly water. It is operated by the town of Orleans; don’t confuse it with the nearby Nauset Light Beach of the Cape Cod National Seashore (parking fees and services differ). Off-road vehicles are allowed; permits must be obtained through the town of Orleans. Life guards; restrooms; food concession. Fees: Parking is free for Orleans residents with a permit. For non-residents, daily parking fee in $15 and can be purchased at the beach from mid-June to labor Day. Non-resident stickers for visitors staying in Orleans are $60 a week, $110 for two weeks, and $125 for the season. Stickers may be purchased at the Nauset Beach Administration Building. 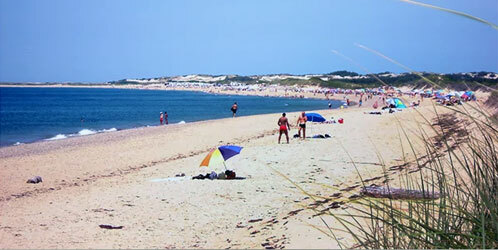 Hardings Beach is the largest family beach on the Lower Cape. 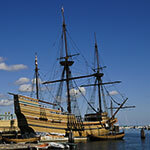 It faces south on Nantucket Sound and has warm and calm waters. The beach has two parking lots, three life guard stations, a bathhouse, and food trucks. The beach has places to play beach bocce ball, volleyball, and wiffle ball. A hiking trail extends behind the beach from the second parking lot. You can launch a sailboat or kayak any place outside the swimming area. Fees: Beach stickers for non-resident parking are $15 a day, $60 a week, and $125 for the season. Non-residents may purchase stickers with cash at the beach booth. Resident and taxpayer stickers are $25. Residents may can purchase stickers at the booths or at 261 George Ryder Road. 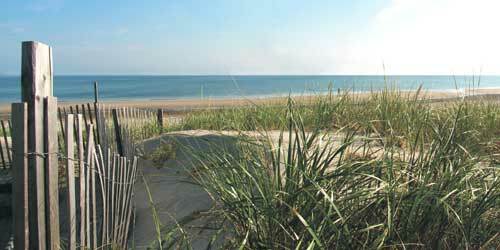 A favorite for families, this beach on Cape Cod Bay has a long boardwalk from the parking area across the dunes to the beach below, life guards, restrooms, concessions, handicap access. Dennis beach map. Fees: Resident beach stickers, $40 per year; non-residents: $20 weekdays and $25 weekends and holidays; $75 for a weekly; $300 for the season. Buy stickers at Dennis Town Hall, 485 Main Street. Beach stickers are required the Saturday of Memorial Day weekend through Labor Day. Located on Nantucket Sound east of the Bass River, this beach is great for families and all manner of beach activities from body surfing to volleyball. The Bass River Lighthouse is located nearby. The eastern end of the beach is for town residents only; the west end is for the public. Life guards, restrooms, paid parking, snack bar, showers, wheelchair accessible. Dennis beach map. 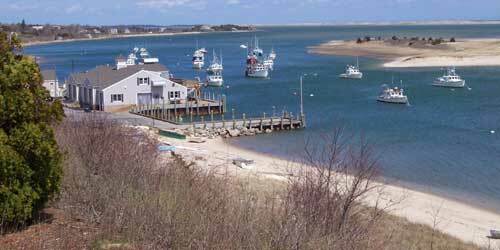 This is a small beach on Lewis Bay, part of Nantucket Sound, with a marina and a jetty. Wheelchair accessible. Open 8 a.m.-10 p.m. Located on Cape Cod Bay and in the town of Truro, this beach has wonderful sand and swimming in the calmer bay waters and a beautiful view of Provincetown across the water. Good, calm water for smaller children. People enjoy watching boats travel in and out of Pamet Harbor. Restrooms; life guards; snack bar. Open to the general public. Fees: Town of Truro parking sticker is not required; daily parking fee is $15. Open: Parking lots are open daily, year-round, 6 a.m.-midnight. Life guards are at swimming beaches from late June through August. Cape Cod National Seashore manages six ocean beaches in the following towns: Eastham (Coast Guard and Nauset Light beaches), Wellfleet (Marconi Beach), Truro (Head of the Meadow Beach) and Provincetown (Race Point and Herring Cove beaches). All seashore beaches include showers, paved parking, rest rooms, changing rooms, drinking water, water quality testing, and lifeguards (late June through Labor Day). Two beaches, Coast Guard in Eastham and Herring Cove in Provincetown, are handicapped accessible and have wheelchairs capable of traveling over sand. First Encounter is a beautiful, calm beach with warm gentle water and a small patch of grass. The tide goes way out, and the colors at sunset are spectacular. The water temperature is in 60 to 70 degrees in summer, and the mild waves are ideal for young children. The ice cream truck comes by several times a day. There is a bathhouse, and a good size parking lot. This is a very popular spot to see the sunset. Operated by the town of Eastham. Visitors may buy a sticker or pay by the day to park at the beach. Buy stickers at 555 Old Orchard Road, Eastham, or Sunday only at the First Encounter parking lot. No lifeguards. Beach is on Lewis Bay at the end of Bayview Street. Handicap access. Seasonal Porta-John. No lifeguards on duty. Operated by the town of Yarmouth. This beach, located on Nantucket Sound in the Town of Barnstable, is one of the most popular on Cape Cod. 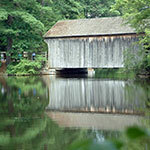 It is a favorite with teenagers and people of college age, but fine for all ages and groups. Big beach with lots of open sandy area. Great for sunbathing and swimming, and a favorite hangout of teens and college-age people. Life guards; bathrooms and showers; wheelchair accessible. Lots of parking. Fees: Daily parking fees for non-residents are $15 on weekdays and $20 on weekends and holidays. Season parking sticker is $200. Available at Hyannis Youth & Community Center, 141 Bassett Lane, Hyannis. The water is calm and warm and the beach is bordered by beach grass. Great views of a rock jetty, harbor traffic, and Great Island. A playground is across the street. Parking is free but the lot is small; a large lot is located nearby at the town pier. Bathrooms are at Baker's Field, also nearby. No food concession. No life guard. This salt-water beach on Nantucket Sound features a picnic area, a food concession, three volleyball courts, a fishing pier, and a boat ramp. Many local people call this beach Smuggler’s Beach. Beach is clean and sandy with comfortable water temperatures. Life guards; restrooms; beach wheelchair available. Open 8 a.m.-10 p.m.
Fees: Non-resident beach sticker fees are $15 for the day, $70 for the week, and $175 for the season. Seasonal beach stickers are available at the Yarmouth Town Hall, 1146 Route 28, South Yarmouth, and at the Chamber of Commerce, 424 Route 28 West Yarmouth . Cockle Cove is situated between Ridgevale and Forest Street beach on the warm, calm waters of Nantucket Sound. Like its neighboring beaches this is a favorite for those with small children and makes a great launch for windsurfers and kayakers. The beach parking lot lies at the end of Cockle Cove Road in South Chatham. Lifeguards are on duty June 21 to September 1 from 9 a.m. to 4:30 p.m. There is a portable restroom. Fees: Beach stickers for non-resident parking are $15 a day, $60 a week, and $125 for the season. Non-residents may purchase stickers with cash at the on-site beach booth. Resident and taxpayer stickers are $25. Residents may can purchase stickers at the booths or at the permit office at 261 George Ryder Road. 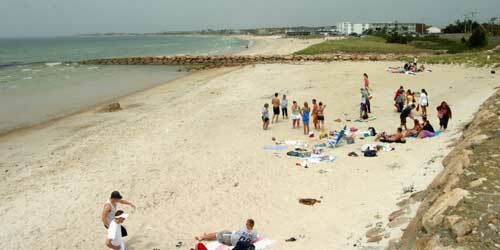 This beach is right on Hyannis Harbor and within a town park. Great view of the harbor, picnic tables, grills. Also, a food concession, showers, and bathrooms are available. Life guards on duty until Labor Day. Fees: Resident parking fee is $30. Non-resident parking fee is $15 weekdays and $20 weekends and holidays. Weekly parking fee is $50. Seasonal parking is $200. Buy stickers at the beach or at Community Youth Center, 141 Basset Lane. This beach, on Nantucket Sound, has a large parking lot and a playground. Life guards; bath house with restrooms and showers; food concession, pavilion, beach wheelchair available. Operated by the town of Yarmouth. Fees: Town beach stickers may be purchased by town residents at Town Hall. Resident sticker is $35. Non-residence may purchase beach stickers at beach booths. Cost for non-residents is $15 a day,$70 a week; $175 a year. This beach, in Hyannis Harbor on Nantucket Sound, is considered one of the best Cape Cod beaches for windsurfing, with good winds all through the season. The beach is divided into two sections, to keep windsurfers away from kids and families. 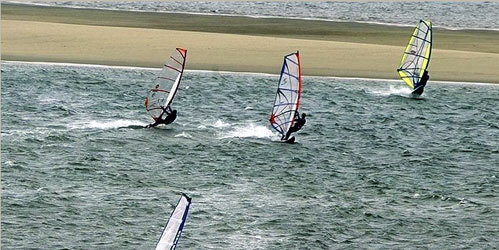 Very popular for windsurfing. Life guards, bathhouse, picnic area, snack bar, volleyball area, wheelchair access. Operated by the town of Barnstable. Fees: Parking permit is required. Fee for non-resident parking sticker is $15 a day, $50 a week, and $200 for the season. Daily permit may be purchased at the beach; weekly and seasonal permits must be purchased at the National Guard Armory, 225 South Street, Hyannis. This beach on Nantucket Sound is located between and Hardings and Cockle Cove beaches. The warm, calmer waters of Nantucket Sound stay comfortable past Labor Day. Children enjoy playing in the tidal pools. Restrooms; snack bar; life guards on duty 9 a.m. to 4:30 p.m. during the season. Part of a six-mile-long barrier beach on Cape Cod Bay, this area, managed by the town of Barnstable, is undeveloped and pristine. Exposed flats and sand bars at low tide delight children; untouched dunes; bird watching; kayaking; hiking on nature trails. Off-road vehicles are allowed with a permit costing $140 a season. Life guards, restrooms, food concession, wheelchair access, and beach wheelchair. large parking lot. Fees: Daily, $15; weekly, $50; season, $200. Daily permit may be purchased at the beach; weekly and seasonal permits must be purchased at the National Guard Armory, 225 South Street, Hyannis. Town beaches run the full length of the Provincetown's waterfront. This beach, parallel to Commercial Street, the main thoroughfare, is a few steps away from the heart of downtown. Park at the public lot at MacMillan Wharf. The West End Beach is most popular for swimming. This beach, on Cape Cod Bay, is popular with families and children because of its mild water temperature, calm water, luscious sand, gentle dunes, and tidal flats with fun tidal pools. No life guards; portable toilets.